Don’t get me wrong – take out is a fabulous thing. There are those nights when you are just not feeling like cooking, it’s hot, you’re tired and busy and it just isn’t happening. We all have our favorite take out spots. But there’s also been more than a few nights when I’ve decided to whip up my simple and easy Mongolian Beef instead of ordering it from my local Chinese restaurant. It only requires a handful of ingredients that I usually have on hand, it’s simple, healthy and DELICIOUS! This Mongolian Beef does require about 20 minutes of marinating. While you could, in theory, skip it if you’re in a hurry, I wouldn’t recommend it. Marinating the beef for only 20 minutes really helps to tenderize the meat and make sure the beef has a delicious flavor that goes much deeper than just the sauce. I like to get everything else ready while the beef is marinating. I get the scallions, peppers, garlic and ginger ready to go for the beef. But I’ll also get any other vegetables I’m having ready to go. I’ll make rice, or cauliflower rice to go with it. Once everything is ready to go, this goes together in a snap! Cook the beef, cook the peppers and scallions and you’re ready to eat a delicious, better-than-takeout meal in about 15 minutes. Mongolian Beef can be very spicy, but this one is pretty mild. I make it exactly like this for the whole family. It’s nice and mild but still packed with flavor and with a little hint of spice. When I’m making it for just myself, I’ll add extra scallions or a couple extra red peppers to kick up the spice level a bit. If you’re someone who really doesn’t like heat, be sure to get all those seeds and membranes out of the peppers before chopping them up. The biggest reason why I love to make my own better-than-takeout meals is because I don’t have to sacrifice any of the flavor while making them so much healthier. Take out usually has a lot of fat, calories and sodium, but when you make it at home, you can make it lighter and just as tasty. I use just a little bit of oil to cook the meat and a little more to cook the veggies. I also add a little sesame oil, because the sesame oil really adds a delicious, authentic flavor to any Asian dish I’m cooking. A little fish sauce, some reduced sodium soy sauce, ginger and garlic and the spices are taken care of. Be sure to use reduced sodium soy sauce or the saltiness of the sauce will overwhelm the flavor of the dish. When I have take out, not only is it high in fat, calories and sodium, but I usually don’t have an abundance of veggies either. That means that I end up eating WAY too many of my points. But, when I make it at home, I can load the rest of my plate with other Asian recipes and they can all be veggies. I love these Chinese Garlic Green Beans, but give Spicy Bok Choy a try too. Or, if you’re looking for something besides the traditional rice, these Zucchini Miso Ponzu Noodles are perfect. 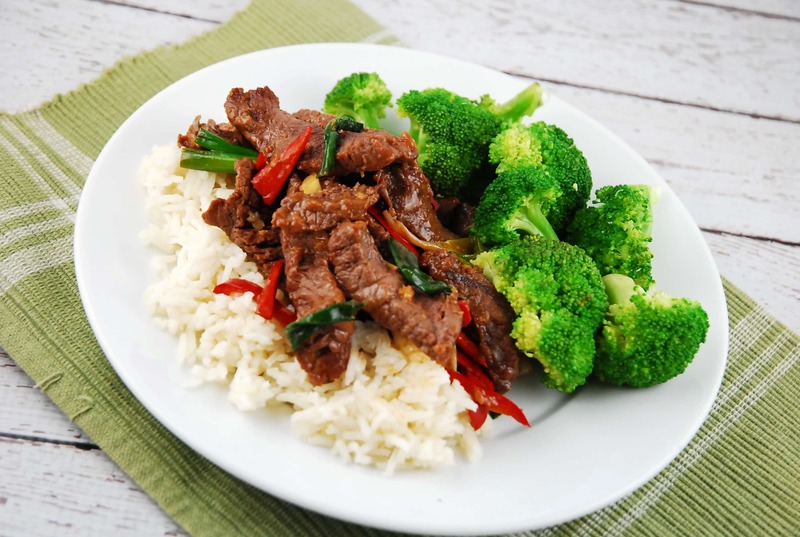 Mongolian Beef is a classic take out dish that’s been lightened up without sacrificing any of the delicious flavor. Give this one a try next time you’re craving take out and you’ll never look back! Packed with flavor, this flavorful dish is done quickly with just a few simple ingredients. Wonderfully marinated sirloin sautéed with scallions and ginger, and just a handful of Smart Points. In a large bowl, marinate the beef with the soy sauce, fish sauce and sesame oil for 20 minutes. Heat 1/2 of the olive oil in skillet over medium high heat. Add in beef, garlic, and ginger, and cook until no longer pink. Remove meat from pan and set aside. Add in the remaining oil, chili peppers and scallions. Sauce for about 1-2 minutes. Then stir in the beef, and toss to combine. What is a mild red chili pepper. I bought both red bell peppers and red Anaheim chilies. I love your recipes and I am the moderator for the Weight Watchers Over 60 Facebook Page and I refer to your website every week. Thanks for providing such flavorful and low point creations! Hi Diane….it only includes the beef. Does the garlic and ginger get added in with the beef? When does one add the extra 1/2 tbsp. of olive oil? Is the second portion of olive oil to sauté the chili peppers and scallions? Thank you. Why can’t I print out any of the your recipes? The ‘Print Friendly’ button only prints out the picture, not the recipe. NOT so printer friendly….must just cut/paste instead.